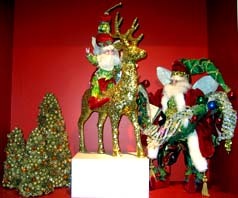 Christmas is a wonderful time of year to catch up with old friends, go to parties, shop and decorate your home. The sky is the limit to the type of centerpieces that you can create. You can have a magnificent table arrangement made at your local florist or craft store. 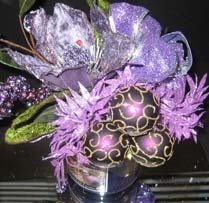 However, if you would like to save money on your table decorations how about creating your centerpieces yourself? Purchasing all of my supplies from Michael’s craft store created this beautiful table arrangement. First I bought a Styrofoam cone, then I hot glued different shapes of cut silver pieces to the cone, and placed the cone on a mirror. 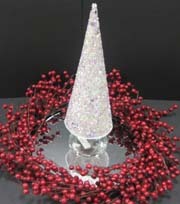 I then decided that my arrangement wasn’t splashy enough, so I placed a red berry wreath around the base of the cone. 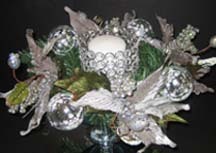 These Christmas centerpieces can be transformed into another theme by changing the wreath to accommodate the season. You can use a twig wreath and hot glue colored eggs onto the wreath and now you have an Easter table arrangement. 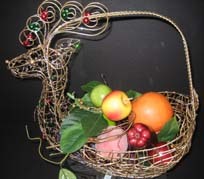 This Christmas centerpiece was created using a wire reindeer and placing fruit in the basket part of the reindeer. You can save the wire reindeer and use it again in the future and change the look of your decoration by substituting the fruit with Christmas balls or wrapped candy. 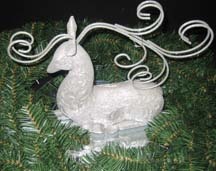 This fabulous centerpiece was created using a silver reindeer surrounded by green pine branches. Not everyone chooses to decorate with red and green during the Christmas Season. How about mixing things up a bit by using lavender, and silver? 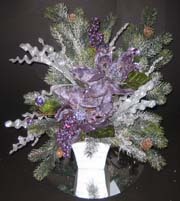 These table top arrangements were created by using a silver base with purple balls and pine branches placed in a basket. This vessel and lid was also purchased at Michaels. Using a 40% off coupon brought the cost of the container to around $20. You can then purchase Christmas balls in whatever color and shape you choose. 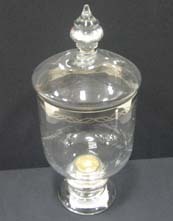 If you prefer, you can fill the vessel with colored sand, glass marbles, pine cones or whatever works for you. This wedding centerpiece was created by purchasing a pine tree for $4.00 and hot gluing beads to the end of the branches. Total cost was around $5.00 and can be enjoyed for many years. 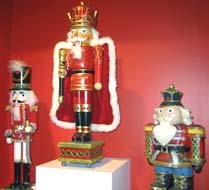 Who doesn’t relate to the play “The Nutcracker” and toy soldiers during the Christmas season? Using one or two Nutcrackers as a table decoration will certainly be a conversation starter for your guests. 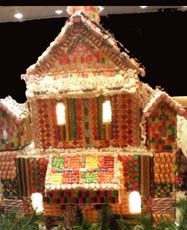 Gingerbread houses are pretty to look at, their aroma brings back childhood memories and they can be eaten as desert. Now that's a home run for a Christmas table decoration. 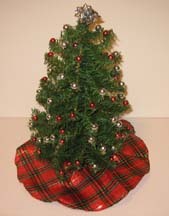 Gluing red Christmas balls onto a Styrofoam cylinder cone and placing the tree in a wooden box created this Christmas Centerpiece. You can also hot glue tinsel in between the balls. This easy to make centerpiece cost around $8. These are just a few Christmas centerpiece ideas that will bring the magic of Christmas to all of your friends and family celebrating your wedding day with you. Get some more great ideas on my welcome page.